Times change and tastes change with them, and in few places is this more obviously evident than feature films designed to capitalise on the popularity of a comedy talent who has made their name in another medium. I'm tempted to further narrow this down to British films and British comedians, but just recently I re-watched Wayne's World and was startled by how awkwardly out-of-date some of it now seems, particularly its recycling of catch-phrases from the original TV spots, incorporated only because fans of the TV version expected them to be there. We all laughed at the time, but a few years down the line and divorced from the skits on Saturday Night Live it's a bit like watching two school kids giggling at jokes only they understand the humour of. The Bohemian Rhapsody sequence is still a scream, but then that was not lifted from the TV show but created specifically for the film. It's a good film gag, well executed. A wide-eyed exclamation of "Schwing!" is not. Being British myself, it's hard not to be particularly sensitive to what happens when British TV and stand-up comedians are stuck in front of a film camera and expected to recreate their comedy personas on an inappropriate new canvas. It took two features to convince everyone that Morecambe and Wise should stick to television, and just one to assure us that George and Mildred, the Are You Being Served? gang and the trio from Man About the House should never be let out of the living room. Even some of the better transitions from small to big screen – Porridge and Dad's Army come to mind – tend to feel like extended TV specials rather than legitimate feature fare. Music-hall (that's the UK equivalent of vaudeville for American readers) and radio acts of the 30s and 40s were particularly ripe for feature film repackaging in their day, their audience pretty much guaranteed until TV came a long to spoil the party. The music-hall comedy style is one that has proved all too specific to its time and place, with appreciation of the cheeky chappie suggestiveness and wink-at-the-audience approach practiced by some of its more prominent stars the sort of stuff that practically defines the generation gap. Music hall was already ancient history by the time I began discovering my comedy heroes and I thus encountered its practitioners in curious retrospect, my age and the changing times making it nigh-on impossible for me to appreciate its appeal. This was comedy my father and grandfather was raised on and was lost on me. There were exceptions. Will Hay in particular not only struck me as a genuinely funny man, but was someone who successfully made the transition from stage to film. 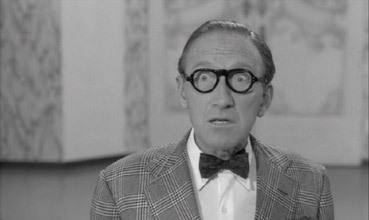 Arthur Askey, on the other hand, I just didn't get. His success was undeniable and in his day I'm sure he had them rolling in the aisles, but watching Arthur do his stuff now is, for me at least, like watching history – it may be interesting, culturally significant even, but it sure ain't that funny. For those old enough to appreciate the man's talent and skill I apologise, but will offer in my defence the fact that I'm not the only one left bemused – The Fast Show's music-hall bore Arthur Atkinson is modelled very specifically on Askey, right down to his appearance and distinctive delivery. Make Mine a Million was clearly designed as a vehicle for Arthur and his particular approach to comedy, but it's nonetheless a valid inclusion in Optimum's Sid James Collection, given that James here gets a rare star billing right after Askey, his name printed in letters almost as large. That he plays second fiddle in plot terms to Arthur's naïve hopeful is inevitable, but it's a measure of Sid's enduring appeal that he almost steals the film from under Arthur's nose. Watching James at work here you can start to see why Tony Hancock apprently saw him as a threat to his own popularity. OK, some plot. Daffy, accident-prone TV makeup man Arthur dreams of having his own show and likes to pretend that he's a big name in the industry. A chance meeting with dodgy but ambitious barrow boy Sid results in him and young cameraman Jack (Bernard Cribbins) becoming involved in a scheme to hijack broadcast airtime to hock Sid's product, a new detergent called Bonko. The stunt loses Arthur his job but makes Bonko a household name, attracting the interest of companies wanting their products advertised in similar fashion. This is unlikely but familiar little man against the system fluff – you'll have no trouble predicting how it all ends – but by way of a then topical and sometimes inventive dig at the silver screen's arch enemy, television, with equal shots aimed at the BBC (here the National Television Corporation, whose board of directors are all stuffy disapproval and staunch traditionalism) and the newly launched ITV (labelled simply The Commercial and run by brash young upstarts). The influence and power of TV advertising also gets a poke in the ribs, with Sid initially unable to sell Bonko to a distrustful public or even the local laundrette because "it hasn't been advertised on the telly." All of which is rather fun, and at that time the cartoonish stereotyping to the TV execs may well have been closer to the truth than it now seems. But the satirical always takes second place to Arthur's clowning, and that's going to be the thing that either wins you over or gets right up your hooter. I had little trouble pitching my tent in the latter camp. For Askey fans I'd suggest this might prove a minor treat and for those familiar with the stars of the period there are even brief cameos by the likes of Tommy Trinder, Evelyn Laye, Dickie Henderson and Sabrina to savour. 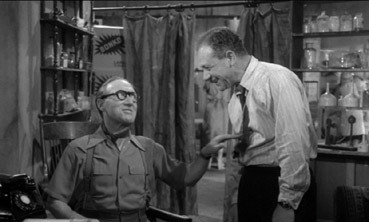 But for the rest of us it's a bit of a slog, a somewhat dated trip down comedy's memory lane (the laundry whites/black woman joke in particular is painfully lost in time), but made intermittently watchable by its shameless and amusing TV baiting, Lance Comfort's brisk direction, and Sid James in full blown dodgy geezer mode. An anamorphic picture framed 1.76:1, which I am not sure is the original aspect ratio – the IMDb suggests 1.37:1, but there are certainly no tight framing issues. The transfer here is very good one, with contrast and sharpness as good as a fair few recent films and hardly a dust spot or compression artefact in sight. There is a very slight wobble at the end of some dissolves, but otherwise a fine job. The Dolby 2.0 mono soundtrack is clean and clear, though there's a slight hum in one of the quieter early scenes. No major problems otherwise. None, not even a little biography of our Arthur. Star vehicles of this sort required an appreciation of the performer's comedy style, and with Mr. Askey I'm afraid I don't just have it. For his fans I have no trouble recommending Make Mine a Million – it's well enough made, busily paced, has a decent supporting cast and looks good on DVD. The rest of you would be advised to proceed with caution.